Learn more about the first master-planned community in Santa Clarita. 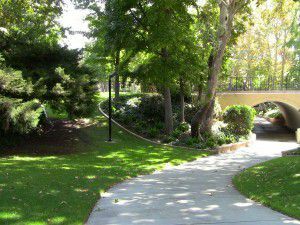 Old Orchard first broke ground back in 1967 in Valencia as the first master-planned community in the Santa Clarita Valley. The idyllic, tree lined neighborhoods are uniquely shaped, with the outer streets connecting in a circle, and the inner streets designed as cul-de-sacs that end at the paseo that runs directly down the middle, allowing walkers and bikers to travel safely off of the streets and out of the way of traffic. The homes in Old Orchard range from modest, single story homes at just under 1500 square feet, to larger two story models with a living space of over 3500 square feet. The two housing phases that make up Old Orchard I and II are separated by Old Orchard Park, where people gather for local sporting events such as softball, soccer, basketball, or enjoy a scenic jog along the paseos. Old Orchard Elementary, a California Distinguished School, is a great place for your children to begin and continue their primary education. Located within minutes of the I-5 freeway, the Newhall Metrolink Station, shopping and entertainment, the Old Orchard community is a coveted choice for many home buyers.